Exclusive privileges at LEGOLAND® MALAYSIA RESORT with Maybank Cards! LEGOLAND® Malaysia Resort is packed full of family fun with more than 70 hands-on rides, slides, shows and attractions. From LEGO® experiment centres to roller coasters, the Resort is a day-long voyage of discovery for the whole family. Maybank Cardmembers enjoy various special offers at LEGOLAND® Malaysia Resort. 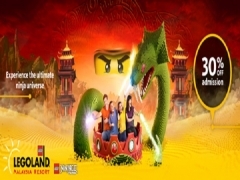 30% off LEGOLAND Malaysia Theme Park + Water Park Combo Ticket, or LEGOLAND Malaysia Theme Park Ticket. Offer does not include Water Park only ticket. Purchase your tickets online via www.LEGOLAND.com.my/promo/MBBOnline2017 (Minimum of 3 days in advance prior to the date of visit) or onsite at LEGOLAND®Malaysia Resort ticket window with your Maybank Card. Quote “Maybank Promotion” before purchasing tickets. Valid till 28 February 2017. Promotions are valid until 28 February 2017. Promotions are valid to Maybank Cardmembers where payment is made with a Maybank Credit/Debit card issued in Malaysia, Singapore, Indonesia, Philippines, Cambodia and Brunei. Offers are only valid for LEGOLAND Malaysia Theme Park + Water Park Combo Ticket, or LEGOLAND Malaysia Theme Park Ticket. Offers did not include Water Park only ticket. Offers cannot be combined with pre-purchased tickets, online sales and any other discounts, rebates or promotion including Mykad promotion, Annual Passes, groups and education offers. Tickets have to be purchased via URL: www.LEGOLAND.com.my/promo/MBBOnline2017, minimum 3 days in advance prior to the date of visit. Ticket cannot be refunded or exchanged for cash and is not meant for any resale purposes. Up to eight (8) one-day Ticket (Adult/ Child/ Senior Citizen) per transaction. Offer is valid upon purchase of one-day tickets at LEGOLAND® Malaysia Resort?s ticketing counter. LEGO, the LEGO logo, the Brick and Knob configurations, the Minifigure and LEGOLAND are trademarks of the LEGO Group. ©2016 The LEGO Group. LEGOLAND IS A PART OF THE MERLIN ENTERTAINMENTS GROUP. Checkout Maybank for more details about this offer and to book your tickets now!